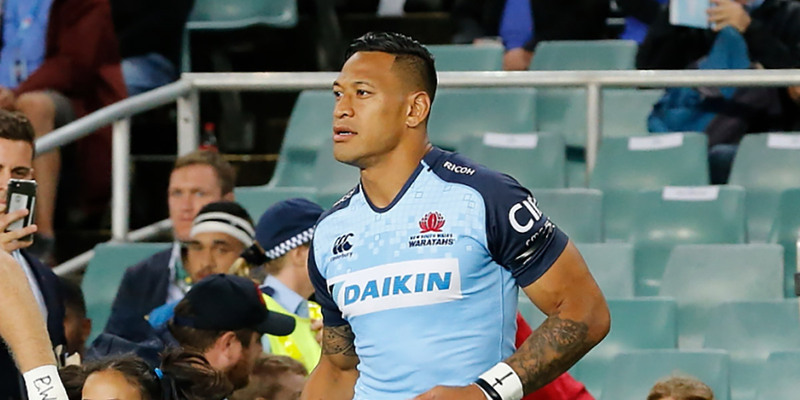 Australian rugby superstar Israel Folau is sparking renewed outrage by once again condemning gay people to hell. On Wednesday, Folau shared an image on Instagram that listed groups of people he believes are set for eternal damnation. “Drunks, homosexuals, adulterers, liars, fornicators, thieves, atheists and idolators – Hell awaits you,” it states. On Twitter, he shared the same sentiment in a comment to a news story about Tasmania becoming the first state in Australia to make the inclusion of gender optional on birth certificates. It’s not the first time the arrogant full-back has felt he has the moral authority to preach fire and brimstone against LGBTQ people. Despite international fury and calls for him to be fired, Rugby Australia and his team, the New South Wales Waratahs, refused to sanction him on the basis of his right to freedom of expression. Rugby Australia has now responded to Folau’s latest post by stating that it “does not represent the values of the sport and is disrespectful to members of the rugby community.” It added that its integrity unit is “engaged on the matter”. In its own statement, International Gay Rugby (IGR), the global organisation for the world’s gay and inclusive rugby clubs, condemned Folau’s new posts. “The effects these hateful comments will have on LGBT people are enormously harmful,” said Ben Owen, IGR Chair. The organisation said that Folau’s homophobia came in the week of the launch of Europe’s biggest LGBT+ inclusive rugby tournament, the Union Cup, which will be held in Dublin in June. “We want all LGBT athletes out there to know that rugby is a sport where you are welcome and respected, a sport of values that doesn’t allow for such bigotry or discrimination of any kind,” said Owen. Australia’s rugby administrators are now under intense pressure to take action against the defiant Folau. “We are taking a keen interest on the findings of Rugby Australia’s Integrity Unit when they meet tonight and applaud the union for taking the stance that these kinds of comments are unacceptable,” Owen said. IGR represents 76 gay and inclusive member rugby clubs around the world, including South Africa’s Jozi Cats.